A Thing Of Beauty – Cook Food. Eat Food. Choosing the right equipment for your kitchen is important. In fact – poor quality products in your kitchen can have as equally a negative effect on your cooking as using poor quality ingredients. Furthermore, buying cheap, poorly made equipment is often a false economy – you’ll be throwing that set of pans with plastic handles out pretty quickly the second you start to take your cooking seriously and need a pan that doesn’t need its handle screwing back on every time you cook (we’ve all been there). Quality not quantity is the key. Five low quality pans does not equal one good pan. 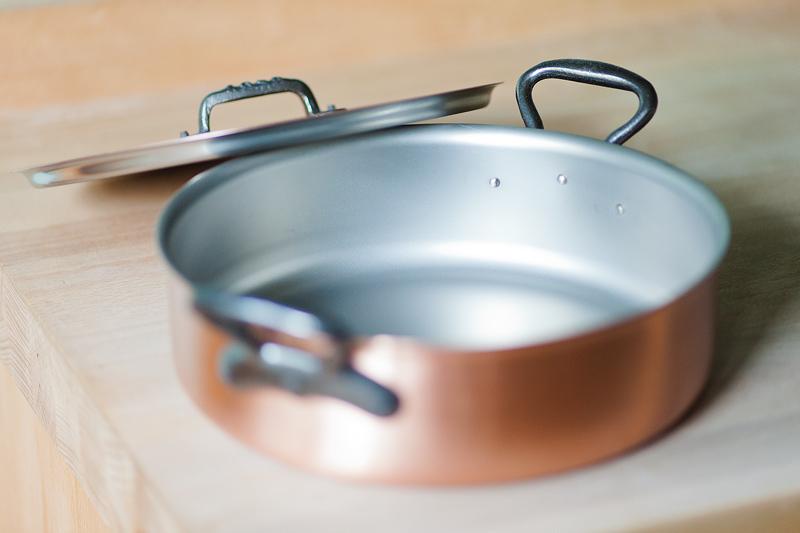 So – if you were to have just one pan in your kitchen what would it be? It would need to last you a lifetime right? It wouldn’t deteriorate with age, in fact, it would get BETTER the more you used it. 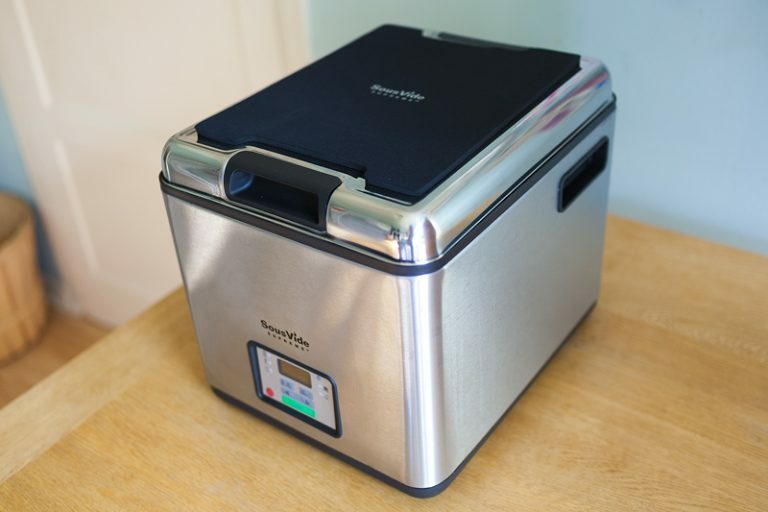 It would need to cook your food evenly, it would need to work just as well in the oven as it does on the stove-top, it would withstand half a day slow-cooking in your oven and then be responsive enough to accurately cook those finishing touches/sauces etc… And – let’s face it, it would need to look good. I have just taken delivery of such a pan. 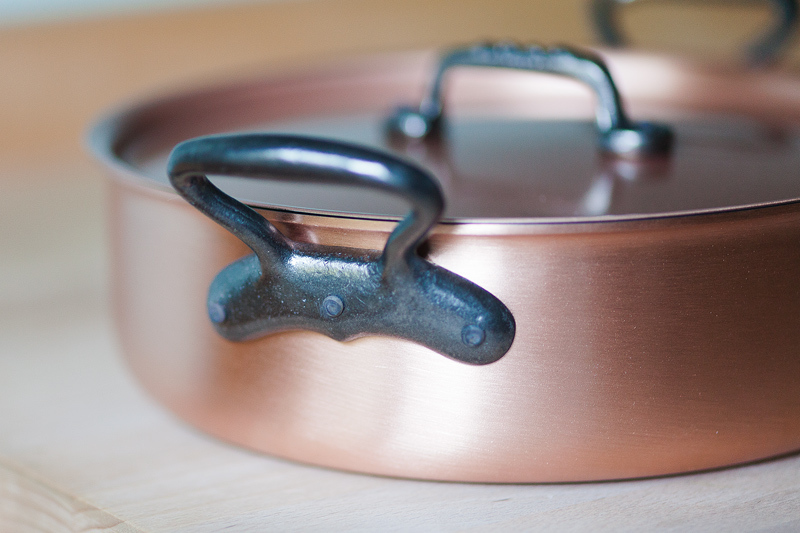 Made by Falk Culinair, the pan I went for was their Copper Rondeau – a pan perfectly suited to both stove-top and oven cooking. 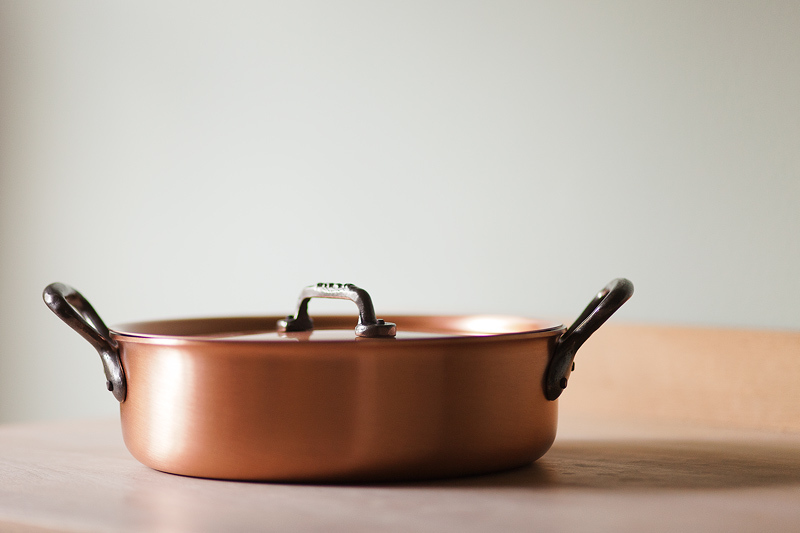 With low sides and a large, flat bottom it makes it perfect for braising, poaching, slow-cooking and the important task of reducing and finishing your sauces. Beautifully proportioned and exquisitely finished. The cast iron handles are ultra solid – riveted to the pan they look and feel like they were made by a skilled craftsman. 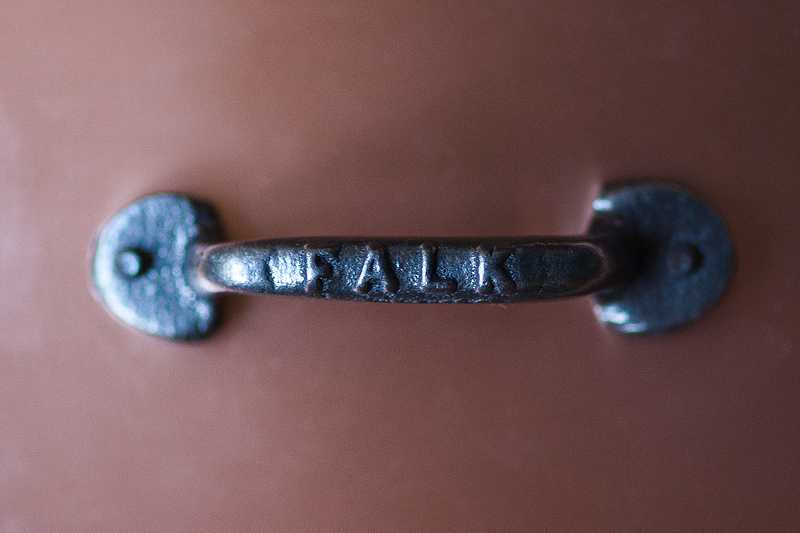 It’s the details that make the difference – you know you’re in good hands when the handle on the lid of the pan has their company name pressed into cast iron. It just doesn’t feel mass-produced, it really is a work of art. Inside the pan – you can see the pan itself is made from 2 types of metal. 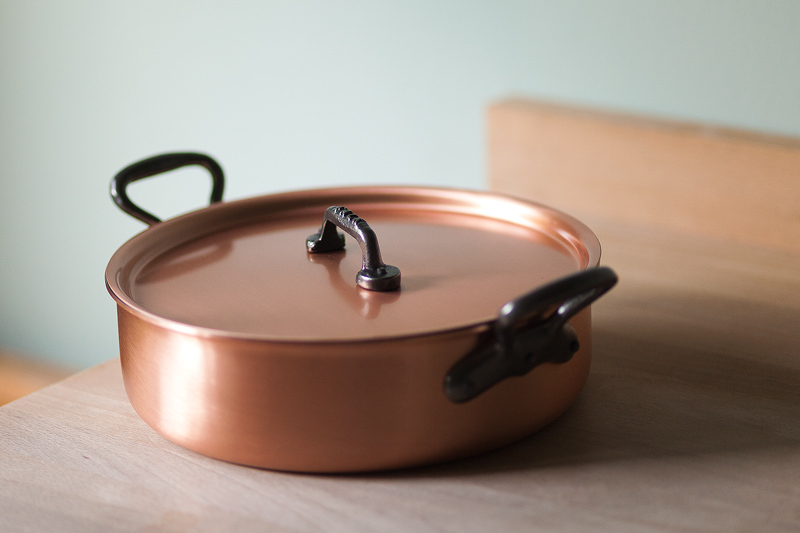 Solid copper on the outside to provide even heat distribution and stainless steel on the inside which won’t react with your food, making the perfect cooking surface. The joining of these 2 metals (a technology Falk Culinair call ‘bimetal’) creates a 2.5mm thick material from which the pan is created. 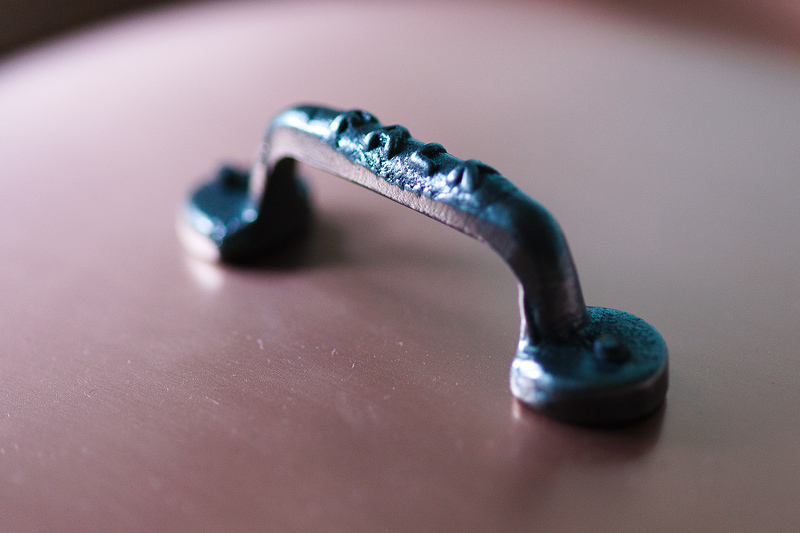 This, along with the cast iron handles, means the pan is reassuringly weighty – and that’s important. You know you’re working with something solid. 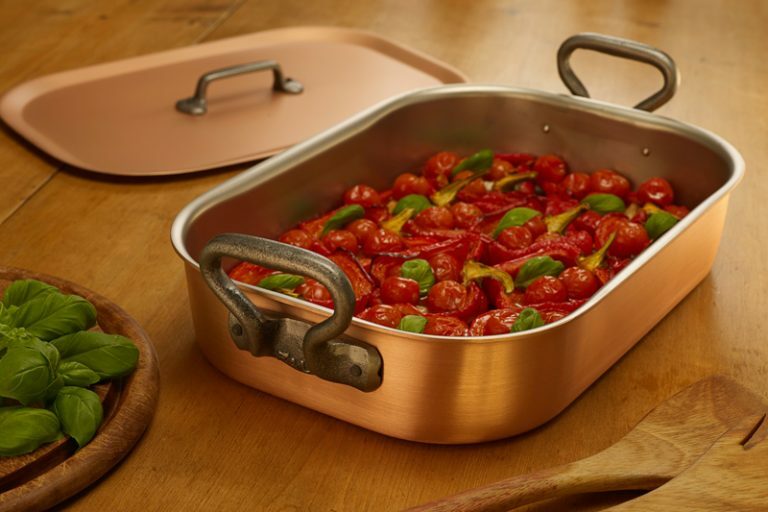 The stainless steel interior is used in favour of the tin that you might see in some other pans which can have a tendency to melt at high temperatures. 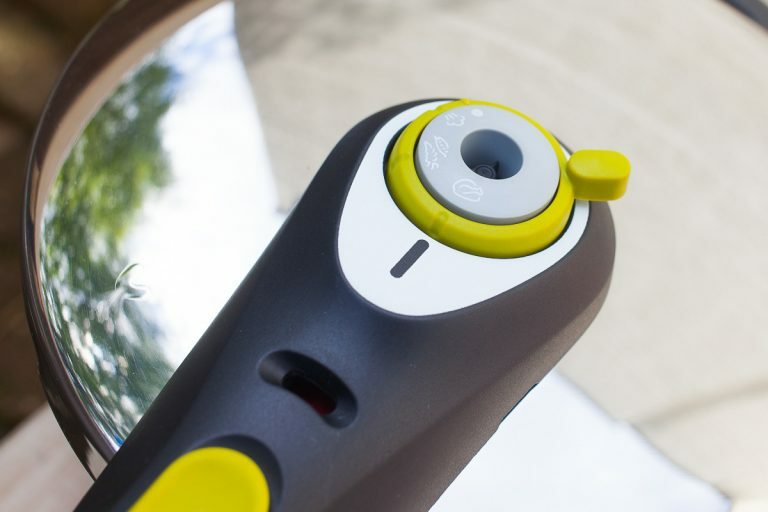 With a stainless steel interior, you won’t be worrying about getting this thing re-lined. I’ll make a separate post on my first dish with this pan but it’s worth considering how you’re going to be looking after it. The copper exterior has a brushed satin finish which, aside from making it look great, means you won’t need to polish it every week and it won’t show your fingerprints in the same way polished copper would. You can polish the pan to keep it looking clean and new but I’m always in favour of my cookware taking on a more natural look over time. This isn’t through laziness – from my experience a good quality pan will benefit from not being over-washed or polished and will take on it’s own characteristics as time goes on. I am, as my friends and family will no doubt confirm, not at my best when it comes to waiting for things or any form of poor service from people or companies I deal with. I expect quick turn around and competent communication. What a pleasure it was then to deal with a company that took the time and trouble to answer all my questions and follow up anything that needed dealing with. Even more impressive was the speed of service – my pan was delivered the day after the order was placed. But – this is the bit that really impressed me – they gave me a delivery slot that was to the hour – not am or pm, not some time before 5 – but TO THE HOUR. Joy! And it did of course arrive within that hour. This stuff’s important. It’s that kind of service that you remember. So far – all good. Top notch. Hugely impressed. I’ll be posting some recipes cooked in this pan to really give it a good test – the proof is, as they say, in the pudding.. or rather, the coq au vin.